RED-Rochester has been working closely with EBP site operations, ESI (our CM), numerous sub-contractors, the boiler vendors, and their transport haulers and the project equipment erectors to arrive at a plan to minimize any disruptions to EBP activities and still allow the boilers to be delivered. Key to this happening smoothly is two-way communication between the RED-Rochester project team and the different operations within the EBP. 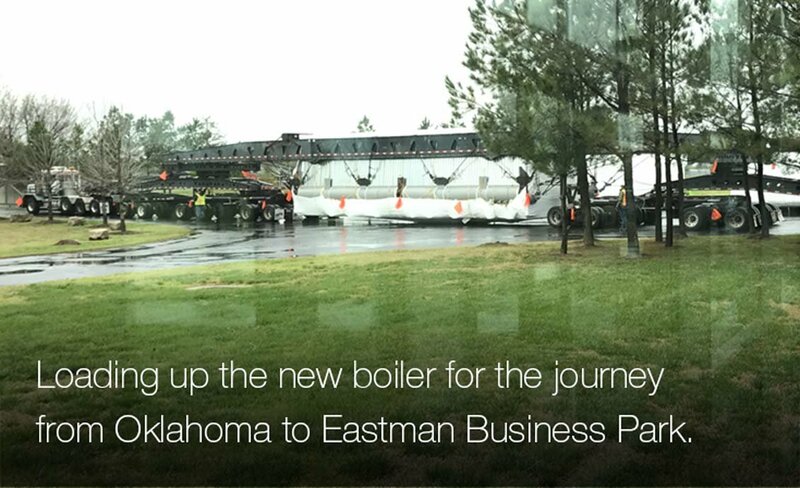 The new boilers are being fabricated in Abilene, Texas (#45) and Tulsa, Oklahoma (# 46-48). Tentative delivery dates are currently set for later in April and late May. Further details regarding road closures and clearing parking lots will be provided prior to the arrival of the boiler transports. All transports will be tracked by GPS and we will be able to know actual locations at any time, so we will know up to the minute arrival times. The main roadway by B371 will be closed for both March and April for the boiler deliveries as well as the erection of the boiler stacks and the final underground tie-ins. Only the B371 section of roadway will now be getting closed. 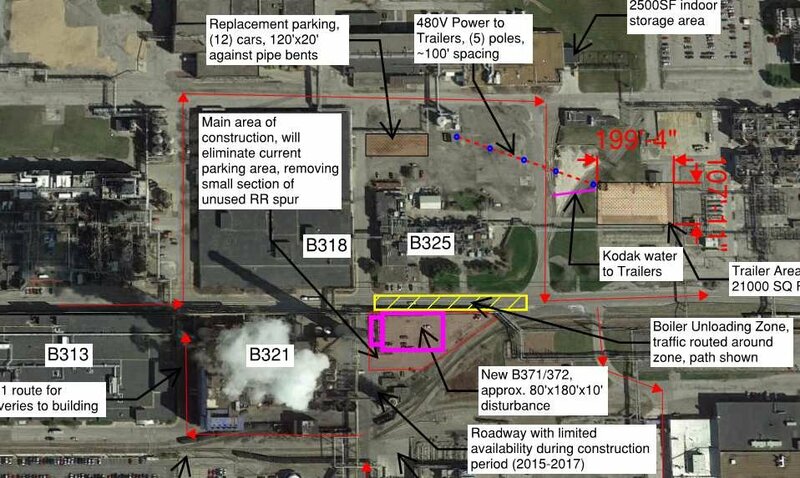 Additionally due to the boiler unloading process, disassembly of the transports, shipping of the transports back to Oklahoma, boiler loading for transfer to the new B371 building, and other related activites the main roadway B371 will be closed. Location of roadway section closed shown below, in yellow. The current plans for #45, # 46, #47 are that for 4 hours, or so, the rail along the job site will need to be closed. This looks to be a non-issue to site operations as this can be scheduled with RSS. Installing #48 boiler may require an 8 hour closure, again, options are available so appears workable. Due to the nature of the construction activities and our focus on safety, if you wish to view the delivery and unloading process of the boilers we would require viewing from the SE corner of B318 on the sidewalk area. This location is outside the construction zone and should provide a good vantage point. There is some additional parking on the north side of B315 if you need to park. If you have a small group who would like to better understand the project, depending on availability of people, we can provide a limited tour of the site if construction work allows a safe site visit. Advance planning would be required, if so please contact Ken Gerew. Plans and dates for Ribbon Cutting and Open House are TBD.